This was John's testimony when the Jewish leaders sent priests and Temple assistants from Jerusalem to ask John, "Who are you?" He came right out and said, "I am not the Messiah." "Well then, who are you?" they asked. "Are you Elijah?" 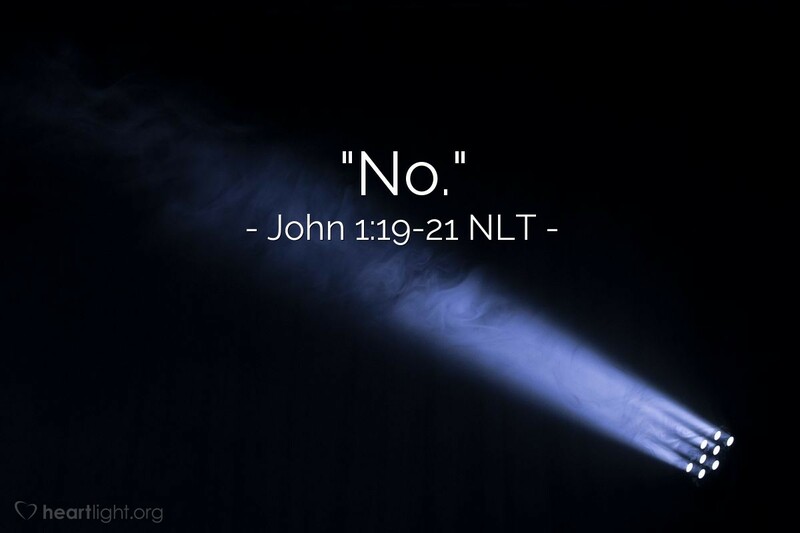 "No," he replied. "Are you the Prophet we are expecting?" "No." Who are you? What would you do to be viewed as important by others? How much does your acceptance by others matter? I don't know about you, but these are convicting questions for me. Most of us are not happy living our lives in the shadow of someone else, no matter how important that person is. Most of us want to be viewed as significant. John the Baptizer, however, lived a life of importance BECAUSE he chose the shadows and pointed others to Jesus, the Light. He directed his followers to Jesus. He refused to be called the Messiah they were seeking. God was pleased with John's choice! Jesus said of him, "John was like a burning and shining lamp, ..." (John 5:35). May the same also be true of each of us! Almighty God, I ask that you make my role in your Kingdom clear. I not only want to be faithful, but I also want to be fruitful. Please show me where you want me to serve and empower me to serve with a heart of humility and grace. My prayer is that you will be glorified in my life and that I will be found faithful in your sight. In Jesus' name. Amen.